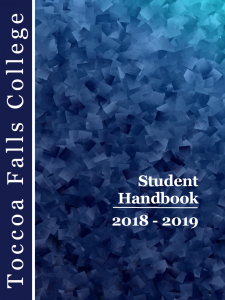 The Student Handbook is the guiding framework for the relationship between the student and the college as it relates to nonacademic matters. Use this handbook as a reference to be successful as a TFC student and utilize resources included in this publication. It is expected that all TFC students review the current year Student Handbook. Students are responsible for all behavioral expectations contained in the current year’s Student Handbook. The current year copy is subject to change.